[post_content] => Hi All!!! HingePoint is back again with the second installment of the “Best of the Innovation Interviews”. If you haven’t enjoyed part one yet, click here . 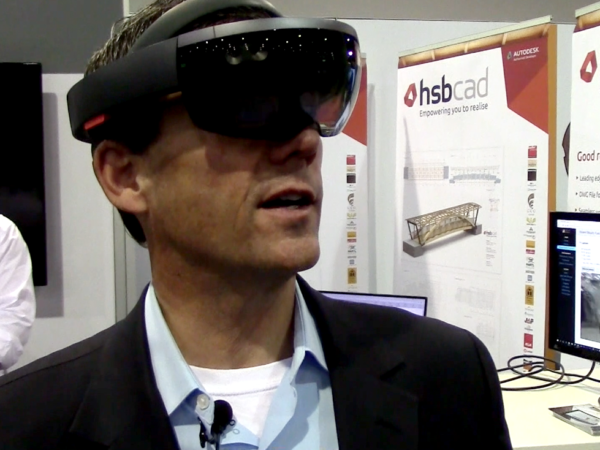 The innovation interviews took place at the Autodesk University 2015 Conference in Las Vegas, and we have some more of the best questions and responses to share with you. Thank you again to all of the interviewees who graciously participated. Question 1: How many years have you been coming to AU and how has it changed over the years? Mike Higgins, EMCS Inc., Senior Civil Engineering Technician – “I've been coming since 2010, missed 2011, but been here every year since then. I guess the big thing that I've noticed, there's been a lot more sessions where their trying to get direct user feedback and are trying to engage the customers. Mark Behrens, Red Viking, Controls Designer/ CAD Manager – “I've been coming here for 6 years and I remember back, the first time I came. The chaos, what they considered registration, etc. Question 2: What is your favorite highlight of autodesk university and why? Mike Higgins, EMCS Inc., Senior Civil Engineering Technician – “It was actually one of the open discussion classes I mentioned before. It was actually put on by the Wisconsin DOT so I really related to it. Question 3: What product or solution are you most optimistic about implementing in the future? Brian Binkley, Gephart Electric, Design Manager – “It's got to be Revit. We are already using it right now, but we are just scratching the surface on what we can do with it. Question 4: What is something you did not know before coming to AU this year? Elias Ponce, TD Industries, CAD Layout – “I think the networking is the thing that kind of surprised me a lot. In the CAD world a lot of the guys do not want to share their secret sauce. Question 5: Do you have a favorite speaker at the conference? Thank you for checking out part two of the best responses on the Interview on Innovation series. If you or a representative of your firm would like to be interviewed about your innovation plans in 2016 visit our Innovation Interview page and click interview me! You had to see it to believe it! HingePoint was on the scene at AU ’15 and was able to speak directly with Autodesk’s own, Heather Karrick. Heather works at the Applied Research Lab, which is part of the CTO’s group at Autodesk. The Applied Research Lab collaborated with a few other groups to make this exhibit come to life. The Living, a company based out of New York, created the architecture itself. This was accomplished using both computers and humans, just like the exhibit. The University of Stuttgart also had their hand in the project. They were responsible for creating a significant amount of the robot control code. Other groups involved were Autodesk’s own UI research team, and the research transfer teams in Toronto. Finally, the LED system was developed by the Marcelo Cohealo Studio. The project has been an idea for about a year, but didn’t really start forming until about 6 months before the conference. It is predicted that as robots start to become more ubiquitous, users will begin working side by side with the new form of artificial intelligence. This prediction is why Autodesk’s Toronto research transfer teams created a new user interface that allows the most novice user to quickly grasp key concepts. Autodesk also chose bamboo because it is a material that robots are typically not working with. Just another added dimension, that makes this project unique. We also spoke with Manuel, who works on the team that created the robot. They refer to the robot as a “co-bot” because they can work side by side with humans. Industrial robots can’t work alongside humans because they have no ability to sense the human and respond accordingly. Actually, it is commonplace to see industrial robots, given restricted space or modified with cages so humans aren’t injured. Conversely, the co-bots are safe to work alongside and are easy to program. It only takes about 20 minutes to program a command, and you don’t have to be a robot expert to install instructions! The co-bots are commercially available today and surprisingly affordable. While this type of robot is not ideal for manufacturing cars, or similar large projects, they are perfect for small to medium size businesses that want automation without a huge investment. Companies are finding the investment cost effective and seeing positive returns in about six months. One of the best co-bot features is the flexibility to use the bot for multiple functions. There is a universal mount that allows owners to apply different attachments based on the particular application in use. Many thanks to the individuals below, for a sensational project and for bringing the Hive to life at AU 2015. We featured several of the leadership in our “Best of Innovation Interviews”, so take a look to learn more. [post_content] => Every year during the first week of December in Las Vegas, Autodesk has their largest users conference. HingePoint was on site this year, gathering information from some of the most innovative people at the show. Check out the video! In the article that follows, we share some of the best responses from a series of questions regarding the conference itself, or the use of several Autodesk platforms. Question 1: What Autodesk product or solution are you most optimistic about implementing in the Future? Question 2: What would you say the theme, or highlight of AU, is this year? Question 3: What would you say to those who couldn’t attend Autodesk University, and what do they need to know? Thank you for checking out some of the highlights and best responses from our Interview on Innovation series. Check our blog to explore other interesting tips and tidbits we learned at Autodesk University 2015!